While the typical Japanese male politician glides through his district in air-conditioned taxis, the typical female voter trundles along the side streets on a simple bicycle. In this first ethnographic study of the politics of the average female citizen in Japan, Robin LeBlanc argues that this taxi-bicycle contrast reaches deeply into Japanese society. 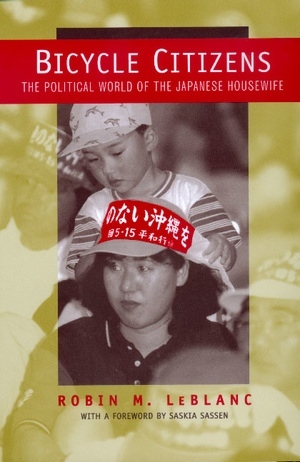 To study the relationship between gender and liberal democratic citizenship, LeBlanc conducted extensive ethnographic fieldwork in suburban Tokyo among housewives, volunteer groups, consumer cooperative movements, and the members of a committee to reelect a female Diet member who used her own housewife status as the key to victory. LeBlanc argues that contrary to popular perception, Japanese housewives are ultimately not without a political world. Full of new and stimulating material, engagingly written, and deft in its weaving of theoretical perspectives with field research, this study will not only open up new dialogues between gender theory and broader social science concerns but also provide a superb introduction to politics in Japan as a whole. Robin M. LeBlanc is Assistant Professor of Politics at Washington and Lee University. Saskia Sassen is Professor of Sociology at the University of Chicago, and author of Globalization and Its Discontents (1998).